Fry may be writing for a wide audience, but the same logic applies in the market. An execution algorithm cannot see the reason behind the widening or narrowing of spreads and sometimes that reason makes all the difference. Conceivably, an outbreak of war and an interest rate change could, in the initial few seconds, have the same effect on the market – but longer term, the implications for the market of one versus the other will be very different. In some cases, an execution decision may not be about understanding context. It may simply come down to convenience. Consider a flow trader who has leftover trades to take care of after clients’ orders have been crossed by an internaliser. Or may be a broker wants to interact with the flow to look at the current positions and flatten out exposure. Going high-touch might be the best route. So, for firms that do want the ability to turn off the autopilot, what sorts of execution system make sense? A full-option, sophisticated execution management system (EMS) designed for high-touch trading may be overkill. What’s needed is an intuitive front-end that allows a trader to take control quickly and easily on those rare occasions when it’s needed. This is not the sort of system that has unnecessary bells and whistles or would require extensive training in order to use it. In other words, many firms may find that what they actually need is hybrid algo trading software, one that is designed to allow most of the trading to be automated but will make it easy for those times when traders want to take over the wheel. As metaphors go, this one is apt. Think of an EMS like a self-driving car. Manufacturers could build one without a steering wheel, but most people would feel a lot more comfortable getting inside knowing one is still there. After all, you never know when you’re going to want to take control – just in case. Learn more about Vela’s execution solutions. 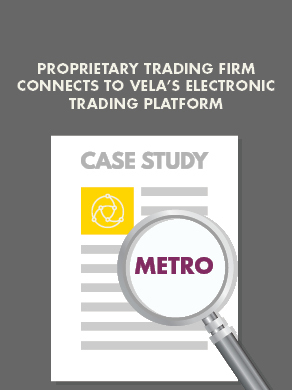 Read this case study on how electronic liquidity providers can rapidly scale their businesses through a multi-broker direct market access platform.